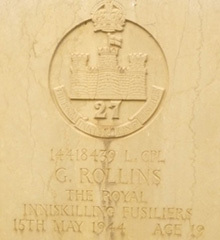 Lance Corporal George Rollins was born on 30th June 1924, the son of George Rollins (snr) and Mrs. Lena Rollins (nee McCollum), Ardtrea, Cookstown. 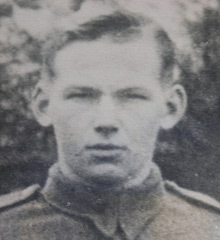 He was killed in action on 15th May 1944, aged 19 as a result of enemy action at the village of Vendittis, near Cassino, Italy. The Battalion assaulted the village capturing it by 0500hrs.